This striking image from the Cassini orbiter shows Saturn's northern hemisphere engulfed in a massive storm that has raged for well over a year. This storm was bigger than Earth when it began, and it's since gotten even more massive. This storm is an apparent example of the Great White Spot, a recurring super-storm that periodically engulfs much of the planet's northern hemisphere. This particular storm has raged since late 2010, and it underwent a second massive eruption in April 2011. It's been given the catchy name of the Northern Electrostatic Interference, because the storm has caused a significant spike in the amount of radio and plasma interference. Cassini has also detected a huge temperature drop in the center of the storm system. You might wonder why this is called the Great White Spot when the clouds are clearly orange. In this case, it's the image that's wrong — or, at least, in false color, as it's actually an infrared image. (That blue line is actually the rings of Saturn viewed from the side.) The orange colors indicate clouds that are deep within Saturn's atmosphere, while the lighter colors represent those closer to the edge of the planet's massive cloud system. This storm is thought to be associated with the dawn of spring on Saturn. 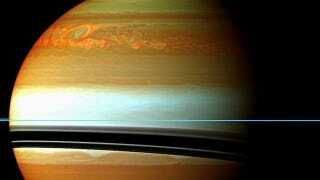 Of course, that could take awhile, considering a year on Saturn is nearly three Earth decades long. Technically speaking, this isn't one of what we might call the "canonical" Great White Spots, which occur at roughly 28.5 year intervals. The last of these was seen in 1990, and before that 1960, 1933, 1903, and 1876. The next of these is likely to occur in 2016. But whatever this particular storm is, it's definitely vast and long-lived enough to earn a place along the "real" Great White Spots.